What is a Vettester? Click on the video below and hear what Frank has to say about it - enjoy! 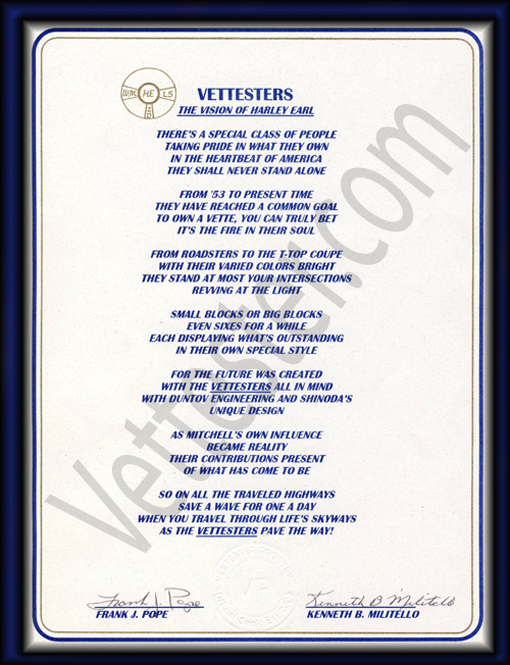 What is a VETTESTER? Individuals that are fans of the Corvette Sports Car, and it's related hobbies; also a nick name for the Car, itself. Your association with vettester.com puts you into the mainstream of the Corvette enthusiast market. Advertising is more than just banner ads. Text, images and videos can all be incorporated in the advertising mix. Product introductions and reviews can be incorporated with links back to our partner's websites. Once a sponsor is added to the design template, the ad will be featured on all past and future content. Interested in learning more about our sponsorship opportunities? Contact us and we'll show you how vettester.com can transform your marketing like no other venue.